Many of the artists featured in the special exhibition Van Gogh to Pollock: Modern Rebels, Masterworks from the Albright-Knox Art Gallery are also represented in the collection of the Milwaukee Art Museum. This is the third in a series of blog posts that will highlight Milwaukee’s artworks during the run of the exhibition. Chaïm Soutine (Russian, 1893–1943, active in France), Children and Geese, 1934. Oil on canvas. Milwaukee Art Museum, Gift of Mrs. Harry Lynde Bradley M1959.375. Photo credit: Efraim Lev-er. ©2010 Artists Rights Society (ARS), New York / ADAGP, Paris. Comparing the painting by Chaïm Soutine (Russian, 1893–1943, active in France) in the Modern Rebels show (Carcass of Beef) with the one in the Milwaukee Art Museum’s collection (Children and Geese, seen at left), it is almost difficult to believe that the two works are by the same artist. The former depicts the body of a cow, flayed open from neck to tail, its scarlet inner organs glistening vividly against the shadowed blue background. In contrast, the artwork within Milwaukee’s own collection is a simple rural scene: a young boy and girl walking down a country path, with abstract brushstrokes suggesting a flock of white geese beside them. A shockingly graphic image of blood and death versus an innocent, bucolic portrayal of childhood. How could these two works have been painted by the same artist? In trying to understand the rationale for creating any painting, one typical approach is to look to the artist’s own life. Yet Soutine is notable for his mystery in this regard. Many of the details of his life still elude art historians, as few records of his life during the height of his career have survived to the present day. What is known is that Soutine was born to a Jewish family in Russia in 1893. In 1913, he emigrated to Paris, both to escape persecution from the government and to continue to pursue his studies in art. Settling in Montparnasse, he soon came to be known as one of the foremost Expressionist painters in Paris, alongside fellow expatriate artists Marc Chagall (French, b. Belarus, 1887–1985) and Amadeo Modigliani (Italian, 1884–1920), during the city’s incredibly fertile years of art production in the 1920s and 30s. 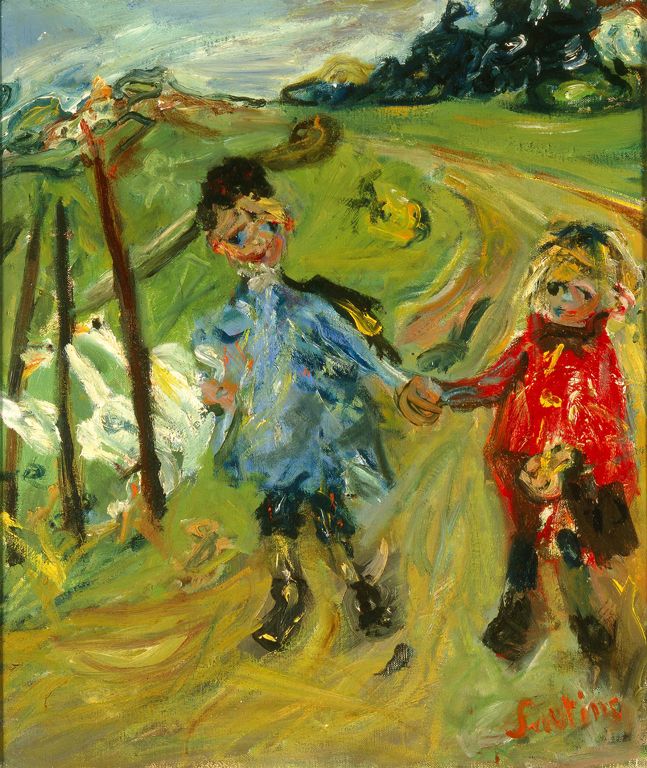 And indeed, the signature abstract painting style that Soutine developed during these years, with brushstrokes so thick that the colors almost seem to flow across the canvas of their own accord, is clearly present in both Carcass of Beef and Children and Geese–thus granting them at least one level of similarity despite their differing subject matters. Yet digging deeper within the symbolism of these two disparate images, and within Soutine’s own life, an overarching theme begins to emerge: the ever-present intermingling of joy and pain, or of the beautiful and the grotesque. 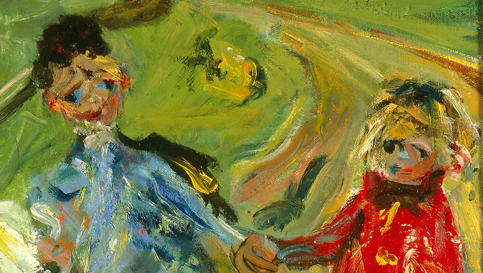 From his childhood within a tight-knit Orthodox Jewish community, which resulted in both a strong, supportive community and the horror and fear of governmental persecution, to his years in Montparnasse, during which he experienced both devastating poverty and participation in an incredibly rich and vital community of artists, Soutine’s life was often filled with a mix of both happiness and suffering. And, upon deeper analysis, this same theme begins to emerge in his paintings as well. From a mere surface-level description, Children and Geese could appear to be nothing but a happy rural scene. Two children walking together, lovingly holding hands, surrounded by the simple beauty of nature. But when focusing in on the figures themselves, an underlying feeling of unease begins to emerge. Chaïm Soutine (Russian, 1893–1943, active in France), Children and Geese (detail), 1934. Oil on canvas. Milwaukee Art Museum, Gift of Mrs. Harry Lynde Bradley M1959.375. Photo credit: Efraim Lev-er. ©2010 Artists Rights Society (ARS), New York / ADAGP, Paris. Soutine’s Expressionist painting style necessarily results in fairly distorted features, often made of just a few daubs of paint. Yet when looking into the boy’s wide, downward-cast eyes, a bit of the happiness of the scene falls away, and there seems to be almost a suggestion of fear. Indeed, when Docents bring groups of children to view this artwork and ask them to describe the scene, many respond that “those kids look kinda scared” or “they’re running away from the geese!” Suddenly, the initial, simple meaning of the work is put into question, replaced by a more complex layering of meanings. Are the children really happy? They are certainly in a lovely, natural setting. But this environment is both beautiful and dangerous. Those pretty white geese could all too easily be provoked to attack, perhaps if the children were to venture too close. Are the boy and girl holding hands out of simple love, or is there also a tinge of fear in their desire for contact? Likewise, the initial horror felt upon viewing Carcass of Beef begins to expand into a more diverse range of meaning when given further thought. Yes, the image itself – a recently-killed animal, its inner organs displayed in all their gore – is unquestionably disturbing. Yet the abstraction of the painting nevertheless allows a hint of beauty to emerge. The use of vivid, primary colors is particularly striking – the interplay of the deep scarlet and glowing yellow within the carcass is undeniably aesthetically pleasing, especially when enhanced by the contrast of deep azure and black hues in the background. Finally, even the meaning of the image contains a hint of positivity. Yes, the canvas depicts a dead animal. But this is no mere purposeless carcass. The most likely location for this scene would be at a butcher’s, as the beef is processed in preparation for sale and consumption. The death of the cow allows the butcher’s customers to live. Thus, the image, while depicting the end of one life, also represents the continuation of many other lives. Joy and fear. Death and life. Of such contradictions is life made. And the paintings of Chaïm Soutine, while diverse in subject, are unified by their powerful evocation of this universal truth. This entry was posted in Art, Curatorial and tagged 20th century art, Chaim Soutine, Collection, European art, From the Collection, Modern art. Bookmark the permalink. I loved your research and article about this painting! I was unfamiliar with this artist and thus was shocked when I saw it last week. I moved quickly away from it but it did not fade from my visual memory. Thank you for allowing the shocking value of it to be tempered with hope and understanding.